The Java Certification training in Kolkata covers the entire Java Programming course. With the course including all the important aspects of Java programming like Core Java, advanced java, SOA, Java 8, Java EE, J2EE, Spring frameworks, JDBC architecture and JUnite; you can build your skills to become an expert in Java Course through this Java Training in Kolkata. 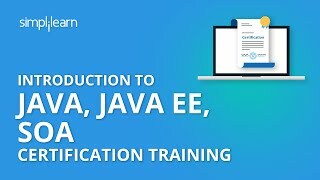 We have also answered core java interview questions, J2EE interview questions and various other java concept questions throughout this Java Certification Training course.